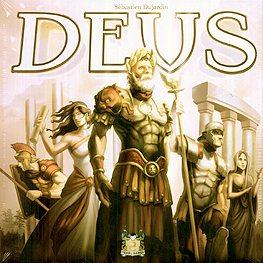 Deus is a game of strategy and conquest for 2 to 4 players. Simple rules deliver a deep and addictive game. As the leader of an ancient civilization, explore unknown lands in order to develop your empire. Found new cities, and construct buildings in order to exploit natural resources and establish trade routes. Set out to conquer barbarian villages or increase your scientific research. Don't forget to maintain good standing with the Gods! Pay tribute to the Gods by making offerings and by building fabulous temples.